Place Setting, originally uploaded by johnwmacdonald. I was hired as the event photographer for a lovely couple's 50th wedding anniversary last weekend. 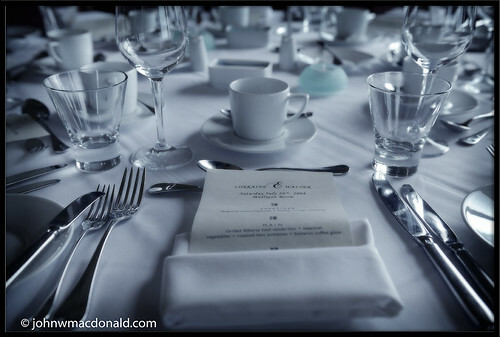 Here is a photo of the dinner place setting at the Brookstreet Hotel and resort. I did a mix of posed formal portraits and candids during the 2 hour timeframe. It was a ball being a fly on the wall snapping away. It would be great if I could do more of this work. Give me a call or send me an email if you like my photos and want to hire me on as your event photographer.